L'ELISIR D'AMORE visto da "BOTERO"
In Spagna al TEATRO DE LA MAESTRANZA di Siviglia il 13,16, 18, 21 Maggio 2016 Dubutto in Perù al GRAN TEATRO NACIONAL di Lima il 25, 27, 29, 31 Maggio 2014 Anteprima italiana al Teatro GIUSEPPE VERDI di Busseto 7, 8, 9 Febbraio 2014. ... is proud to present in international preview, the lyric opera “Elisir d’Amore“, playful opera in two acts based on the Felice Romani libretto. held in a magnificent chest as the Giuseppe Verdi Theatre in Busseto and with aa character cast of worldwide fame, like Eva Mei, Michele Pertusi, Celso Albelo e Manuel Lanza. 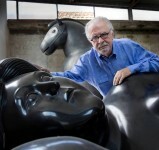 The image of every character is based on Fernando Botero paintings, and will get life with the great Donizetti music. 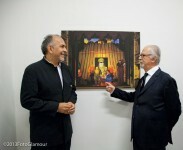 As Botero affirms: ”the colours are a feast and the circus gives us the possibility to link all their shades, also the contrasts more extreme, making them beautiful and naturals”.